VBE (which stands for Visual Basic Editor) is a separate application, integrated with Excel. Here, you can write or edit your macros. In order to open VBA, press Alt + F11 or go to DEVELOPER >> Code >> Visual Basic. The DEVELOPER tab is hidden by default. Check this lesson, to learn how to show it in the ribbon. A new window will open. It will most likely look different than the one below. You probably can’t see the Immediate window. If you want to show it, use the Ctrl + G keyboard shortcut or click View >> Immediate Window from the menu bar. The ribbon replaced the menu bar in Excel, but it is still present in VBE. Here, you can find commands that can be used to control various components in VBE. Additionally, you can control them by using keyboard shortcuts. Just use Alt + underlined character from the menu. In the Toolbar, you can find buttons to which you can have quick and easy access. For example running and stopping macros, switching back to Excel, saving the macro and more. This window shows the tree diagram with every workbook and its worksheets that are currently opened. You can expand and collapse them by clicking the plus and minus signs. By default, this window is empty. Here, you can put your VBA code. 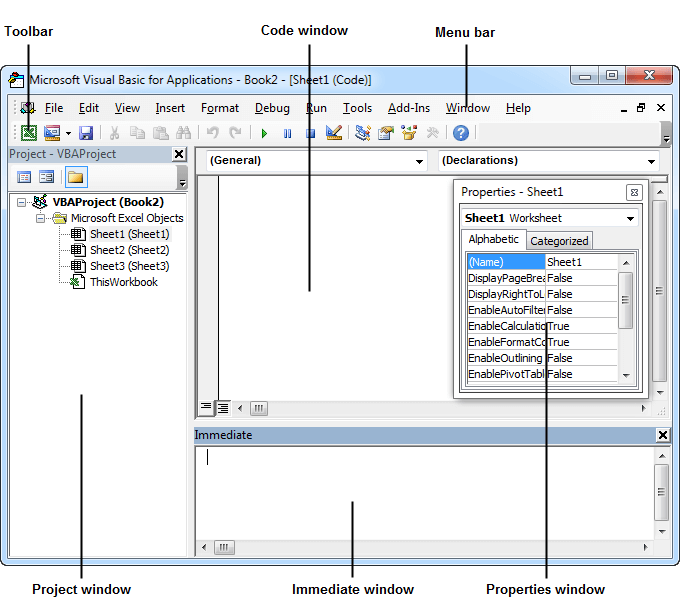 In order to open this window double-click one of the objects in the Project window. This window is useful if you want to debug your code. You can hide it by clicking the „x” button in the upper right corner. As the name suggests it contains a list of properties that define this particular object. There are even more windows in VBE than those presented in the image. Go to View or use the Left Alt + V shortcut to display them.